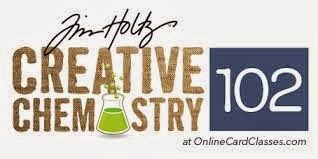 CREATIVITY IS CONTAGIOUS: BABY IT'S COLD OUTSIDE! Brr ... Baby it's COLD outside! What a perfect theme for those of us who are experiencing winter ... and NOT on a beach! 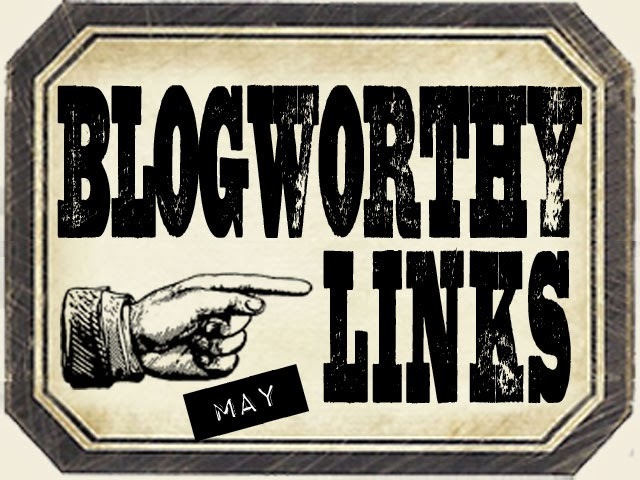 Susan Mostek is hosting this month's art adventure at Creative Carte Blanche! I hope you'll join us! 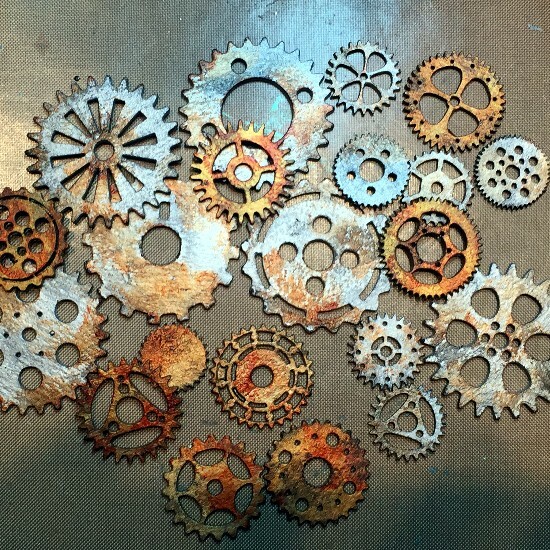 When trying to come up with an idea for this challenge, I started looking around my art studio and really zoned in on gears. It was amazing to me how much they resemble snowflakes. Well, maybe in a weird way they do! Anyway, I decided to mix actual snowflakes and gears to create a unique snowman. 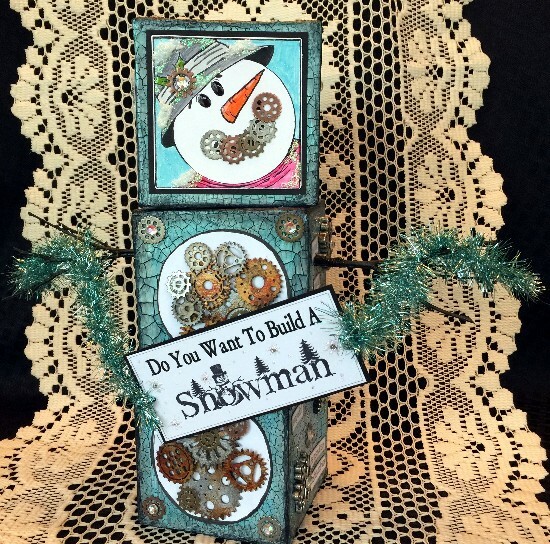 I created this unique little guy from basic blocks that I fashioned out of chipboard, cardstock, some DecoArt Media products, metal and chipboard gears, sticks out of my yard, a little bling and a couple of our guest artist this month Beverly Seymour's B-Line Designs stamps. If you get a chance, check out her website. 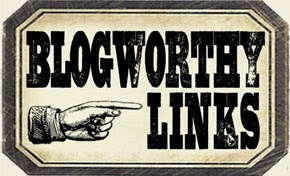 HERE is a quick link to her catalogs of stamps. They are amazing! Well ... do you?? Then let's get started! 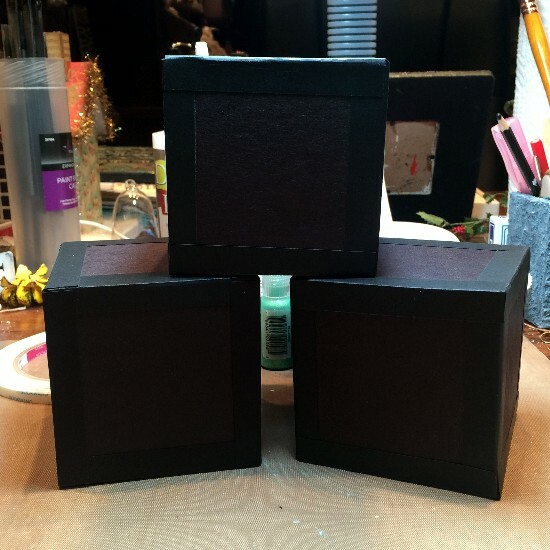 First you create three blocks from chipboard. My blocks are 3 1/2" square. I used "structure strips" to join the chipboard squares together. These were made from 1" x 3 1/2" strips of cardstock, and folded in the center. Each side of the strips has a 1/4" piece of Scor Tape (double sided tape) to hold the block together. Each block requires six chipboard squares and twelve structure strips. 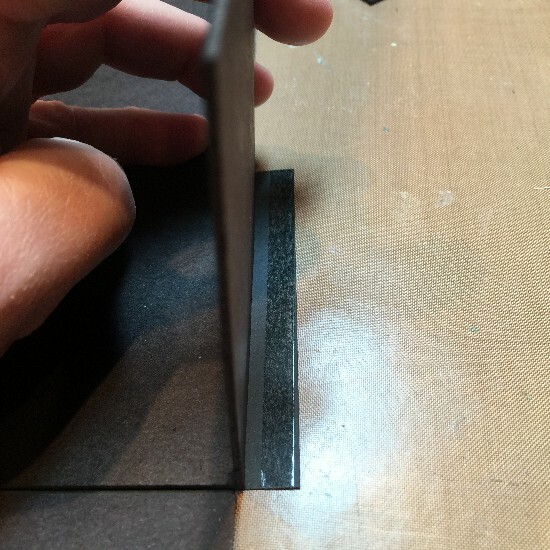 Simply remove the tape backing and place one side of the structure strip underneath an edge. Then place another chipboard square upright along the edge of the chipboard block with the tape already in place. 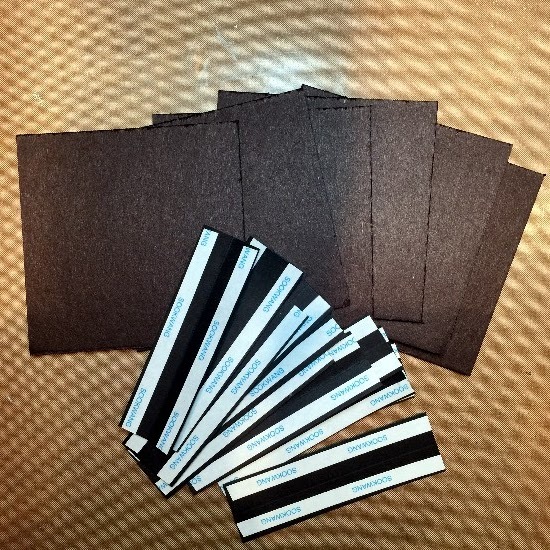 Remove the tape backing and while the chipboard pieces are perpendicular to each other, press the cardstock strip up against the standing chipboard piece. 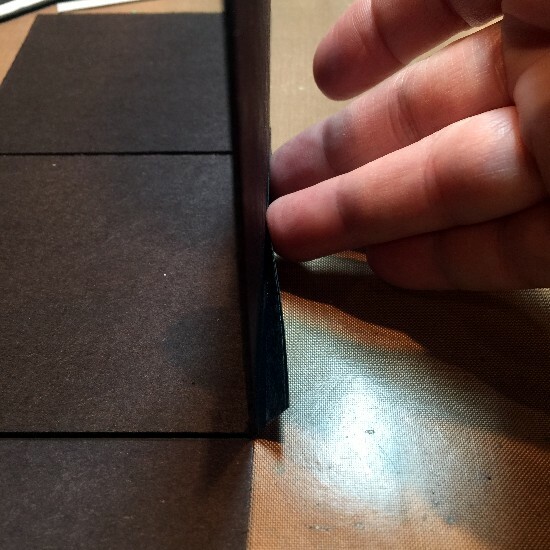 Then lay the chipboard square down and there will automatically be a perfectly spaced joint. 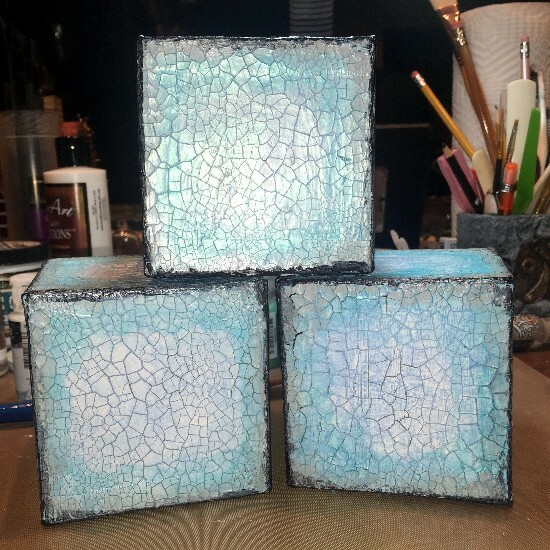 Continue to join the chipboard squares together until you have created a block. Do this three times to make three blocks. Here is your snowman at this point. 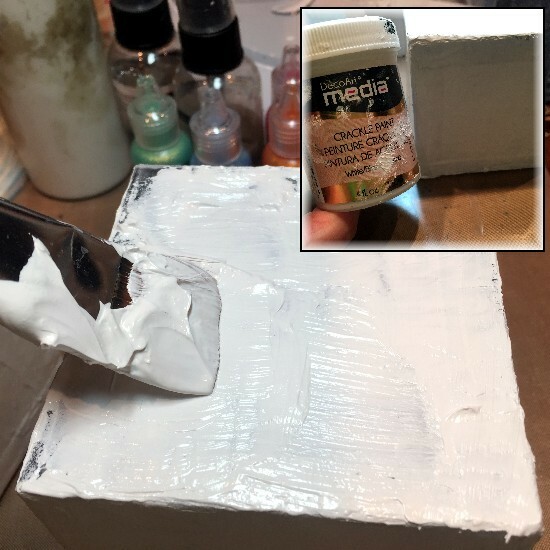 I put on some gloves (not necessary) and added DecoArt Media Modeling Paste all over the blocks using my fingers. You could also use a palette knife or some other tool but I just love using my fingers! Let this air dry and continue to add until all sides of the blocks are covered. 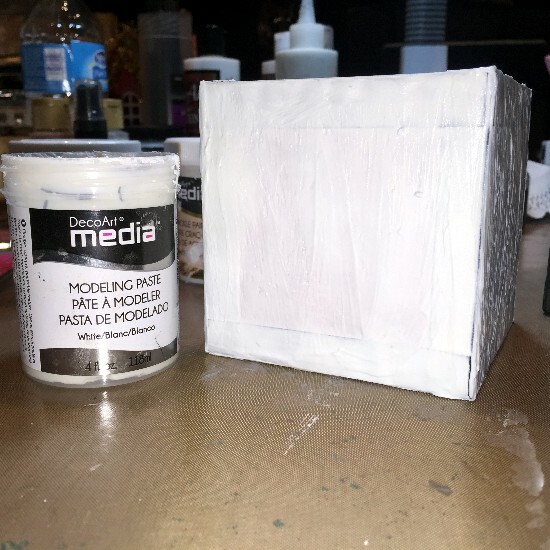 I used the Modeling Paste because it adds a little bit of texture and it is opaque so that whatever color you add on top of it will be a more pure color. 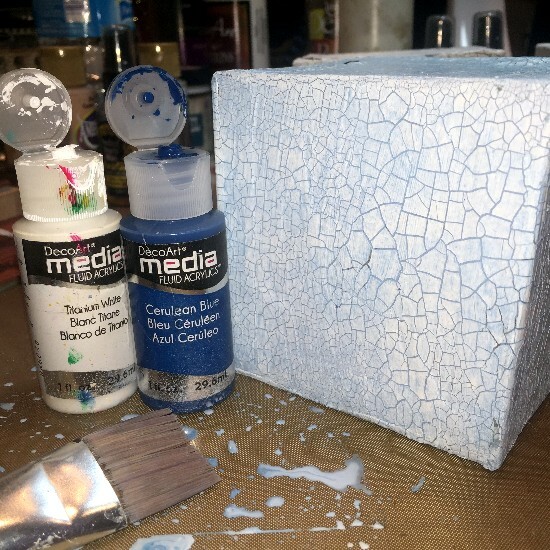 Once the Modeling Paste is dry, brush over all of the sides of blocks with DecoArt Media Crackle Paint. It is also opaque and will dry white. The more paste you add, the larger the cracks. The less paint, the smaller the cracks. Let completely air dry. LOVE these cracks! This is your snowman at this point. I wanted my blocks to be sort of a frosty blue color so that the white snowman would really stand out on the block fronts. 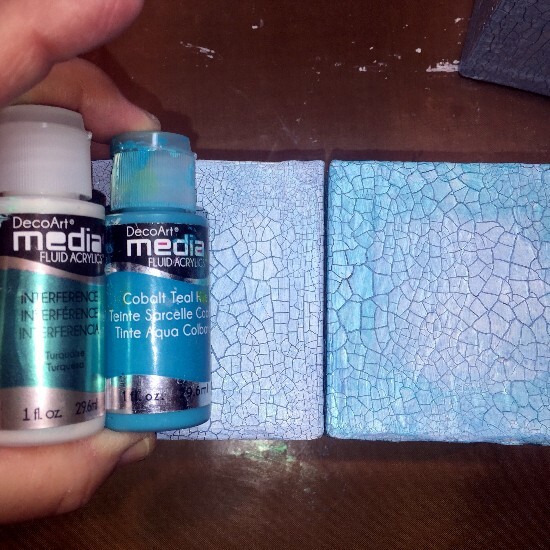 I combined DecoArt Media Fluid Acrylics Titanium White and Cerulean Blue and brushed a light coat of paint over all of the blocks. 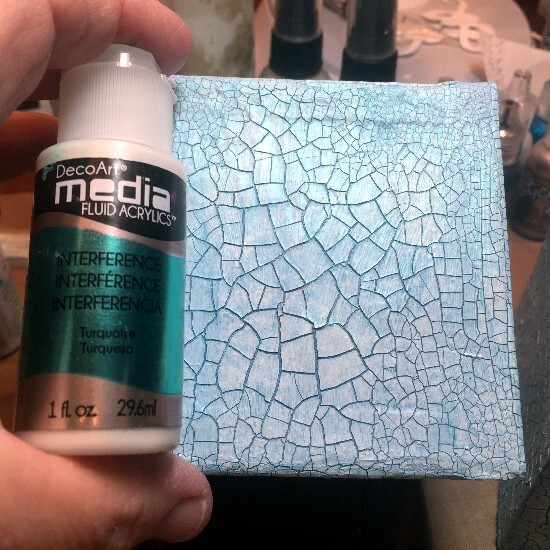 Next I brushed a thin, random coat of DecoArt Media Fluid Acrylics Interference Turquoise over the surface of the blocks. The interference paint brings a showy iridescent glow to the paint and when the light catches it ... it's beautiful! Very frosty looking. 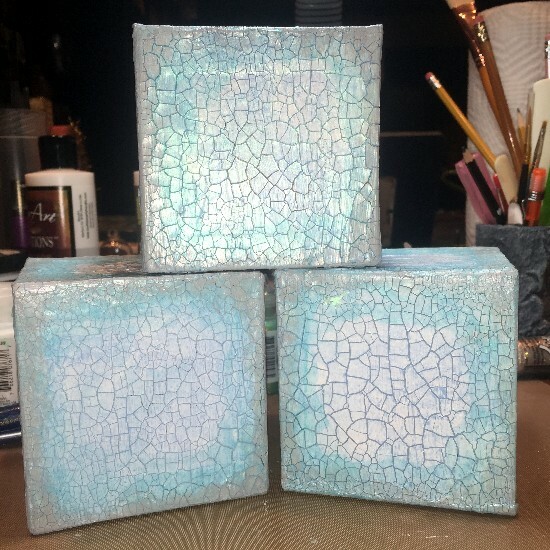 To add a more blue-ish wintery edge to the blocks, I mixed DecoArt Media Fluid Acrylics Cobalt Teal Hue and Interference Turquoise and brushed it around the edges of the blocks; brushing from the edge and feathering inward. 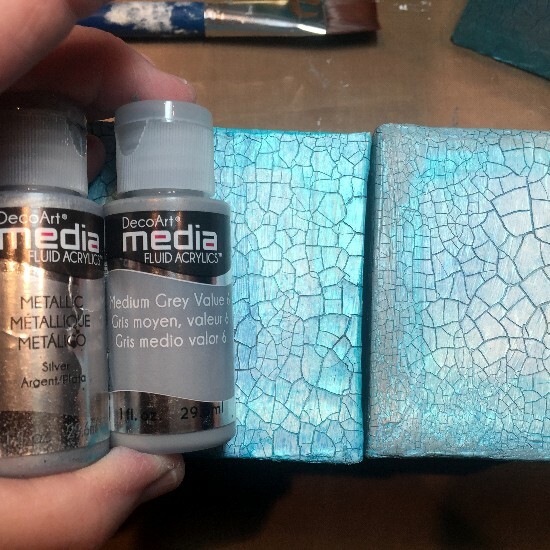 Then I added a mix of DecoArt Media Metallic and Medium Grey Value 6 together to create a bit of a shadow and age effect around the edges of the blocks. Again, I gently feathered from the edges of the blocks inward. Notice the iridescence of the block on the left? That's the Interference Turquoise paint. Love it! Here are the blocks at this point. But something is missing ... a defining edge to each block. 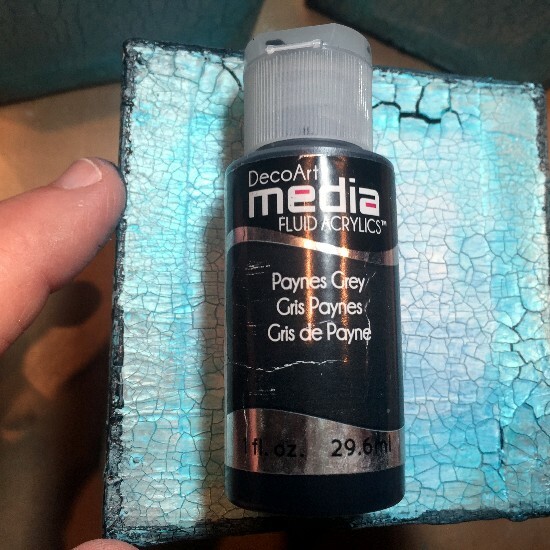 Enter DecoArt Media Paynes Grey Fluid Acrylics and my finger again! I paint with my finger a lot! I love the way painting with your finger feels and how it really makes me feel like I am more a part of the art I am creating. I also like the randomness that paint on your finger leaves behind. Here are the blocks now; all crackled, painted, defined and ready for the snowman and whatever else is to come. 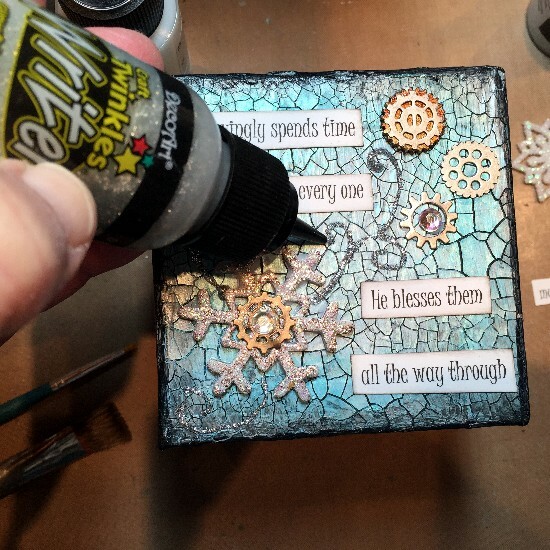 After this picture was taken, I added some DecoArt Black Antiquing Cream over the surface of the blocks and wiped off most of it using a damp cloth. 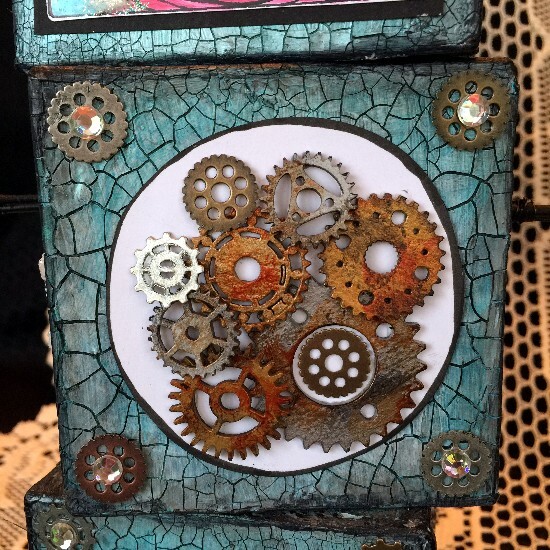 I left the black only in the cracks to emphasize those and blend the image of the gears with the crackled, vintage look of the blocks. 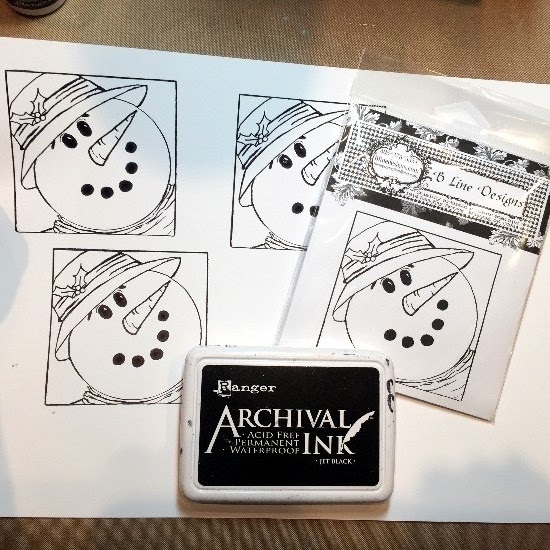 I absolutely LOVE this snowman stamp by B Line Designs. He is the perfect face for my quirkly little guy. I stamped out several of the images on a sheet of stamping paper using Jet Black Archival Ink and then heat set the ink. Then I painted the snowman using DecoArt Media Fluid Acrylics: Pyrrole Orange for his nose, Primary Magenta for his scarf, Viridian (Green) for the holly, Dark Grey Value 3 on his hat and a mix of Medium Value Grey 6 and Metallic Silver for the hat band. What is a snowman without a little snow on him? 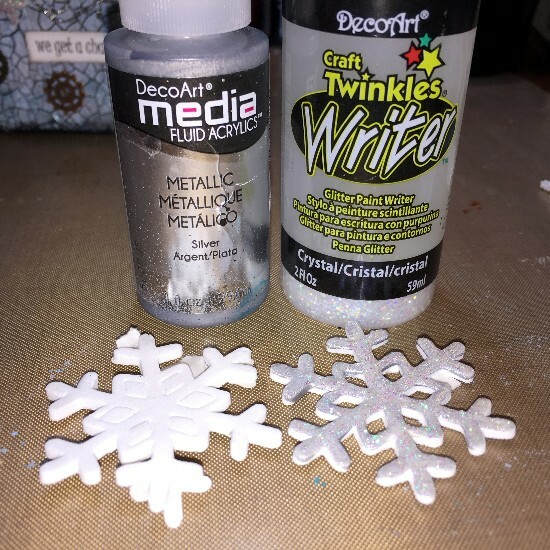 I made my own snow using DecoArt Media Modeling Paste and sprinkling a little glitter in it while wet. See the shiny areas on his hat? That was done with a DecoArt Twinkles Crystal (glitter) Writer. You'll see more about those in a bit. 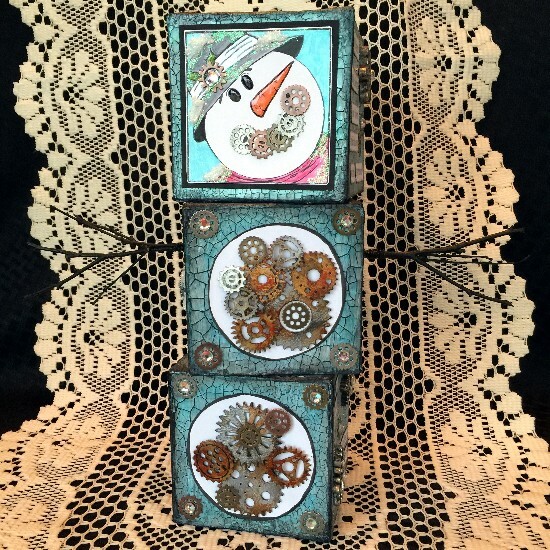 I set the snowman face to the side to air dry and began working on some chipboard gears. 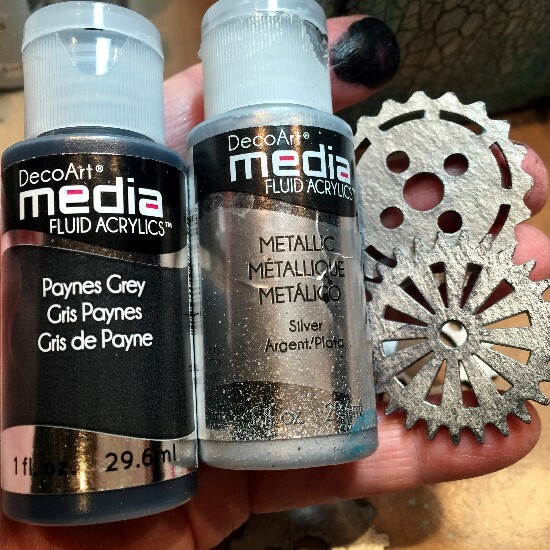 First I used Metallic Silver to cover the chipboard and then using my finger, I softened the shiny silver by wiping a very light amount of Paynes Grey randomly on the gears and specifically around the edges to create a worn look. Not all metal is silver. 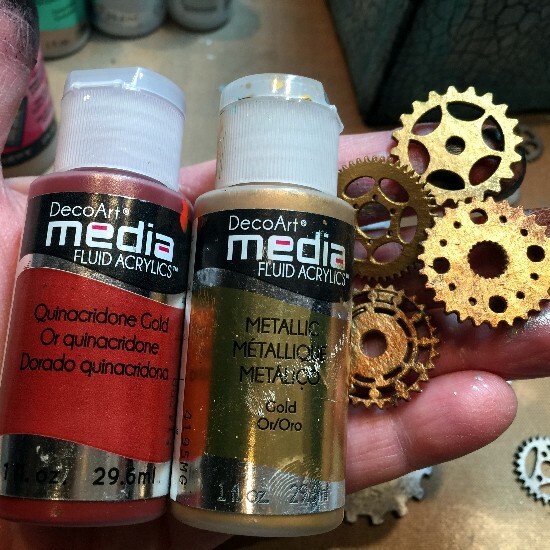 So I made more gears using DecoArt Media Metallic Gold and then adding Quinacridone Gold to add that rusty look randomly on the gears and around the edges. Finally, I added some more of the Paynes Grey just at the edges to define them and add more of a distressed look. 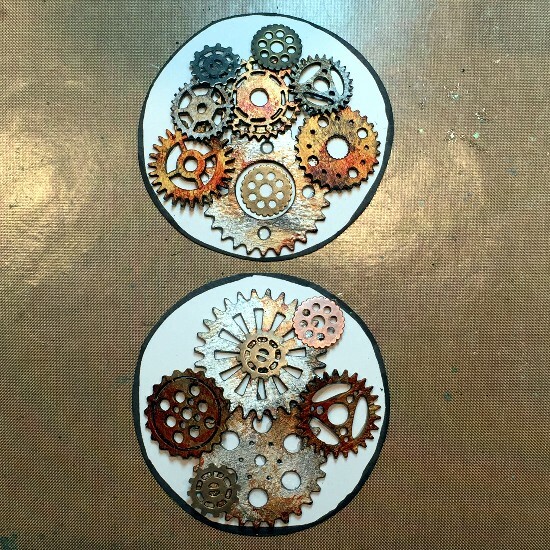 Here are the plain chipboard gears after being transformed with DecoArt Media Fluid Acrylics paints. I love their rusty, grungy, steampunk-ish appearance. Now to decorate the very top block. 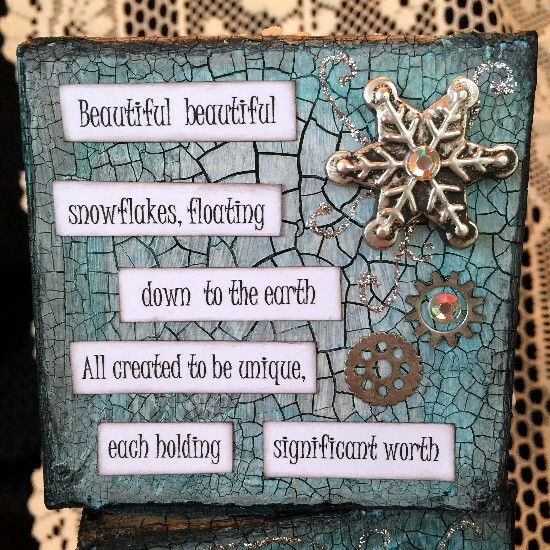 I had a snowflake in my stash of Christmas stuff that I simply pulled out and glued to the center of the block. 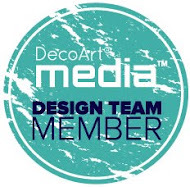 I used DecoArt Liquid Glass as my glue. 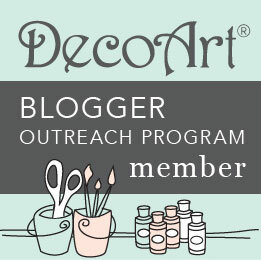 I am in LOVE with DecoArt Liquid Glass! It dries clear but is not glossy. 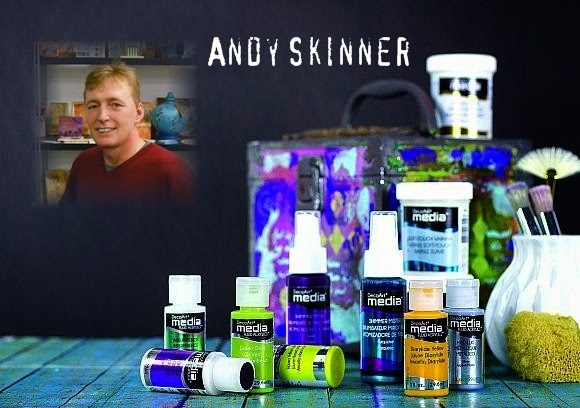 It works wonderfully as a glue, creates a faux glass look and it also can add dimension to things. I added Liquid Glass to my snowman's carrot nose and black eyes. They appear to be raised from the snowman's face. 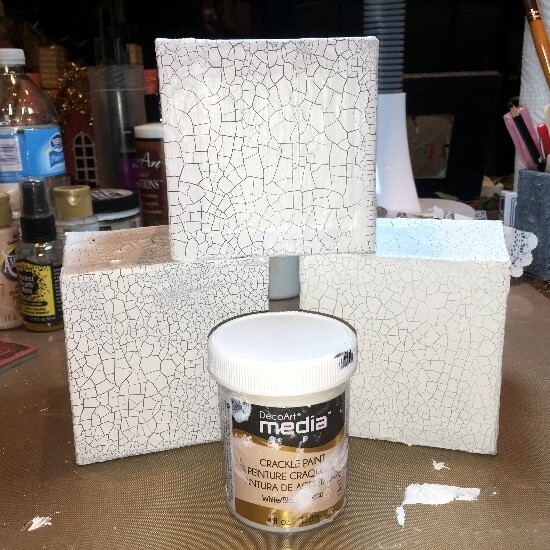 Then I added little metal gears to each corner of the block using Liquid Glass as my glue. I added a rhinestone piece in the center of each gear. 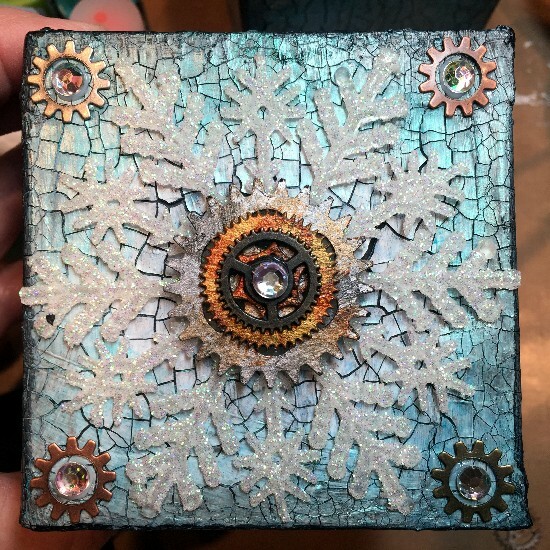 I added two of the chipboard gears to the center of the snowflake and then a metal gear topped with a rhinestone to complete the snowflake. See how the gears blend so perfectly with the snowflake? Here you can see the how the Liquid Glass creates the illusion of a raised nose and eyes. I glued small metal gears over the mouth and added a metal gear and rhinestone to the hat band. All created to be unique, each holding significant worth. To bless the world with beauty, to sparkle the world with love. And because we are so different, we get a chance to shine. I think He takes great care. He makes them precious and rare. Imagine what He thinks about YOU. I figured out how to divide up the poem for each side of the blocks. I typed out the words and sized each phrase to fit on the blocks. Then I printed them out on a piece of heavy cardstock, cut them into pieces to be glued on to every side of the blocks and edged them with black ink. Each side is embellished differently. Different shapes and sizes of snowflakes adorn each side. Little metal gears; some with rhinestones are on every side. Each side also has metallic silver glitter flourishes and designs made from DecoArt's Twinkle Writers. And of course, each side has it's section of the snowflake poem. The Twinkle Writers are super easy to use and the pointed tip allows for finer writing or drawing. These were some foam snowflakes I had in my Christmas stash. I simply wiped my finger over the surface of the snowflake that had Metallic Silver paint on it. Then I added the Crystal Twinkle Writer on top of the silver snowflake. Done! Next, I used another of B Line Designs wonderful stamps. 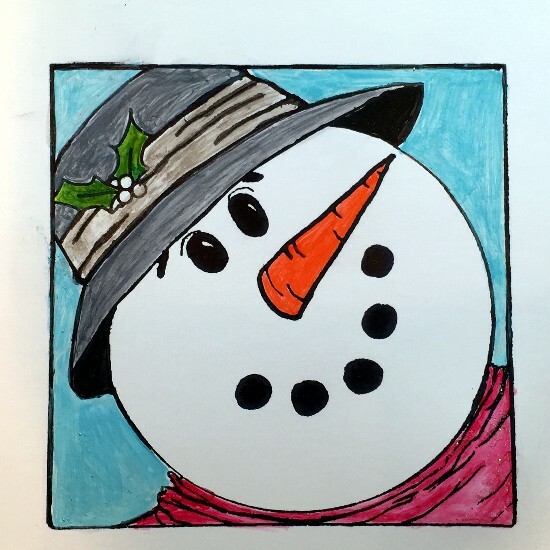 The one above is titled Snowman. Isn't it precious? 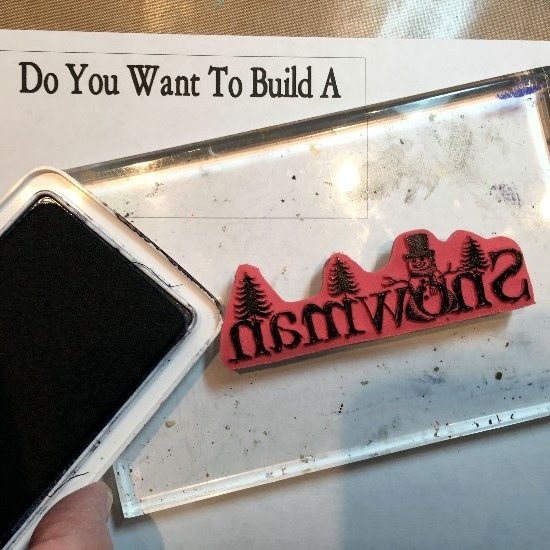 I created "Do You Want To Build A" on my computer and sized it to fit with the Snowman stamp and also to be a cute sign for the snowman to hold. Once inked with Archival Jet Black Ink, I centered the snowman stamp under my computer letters and created the sign. 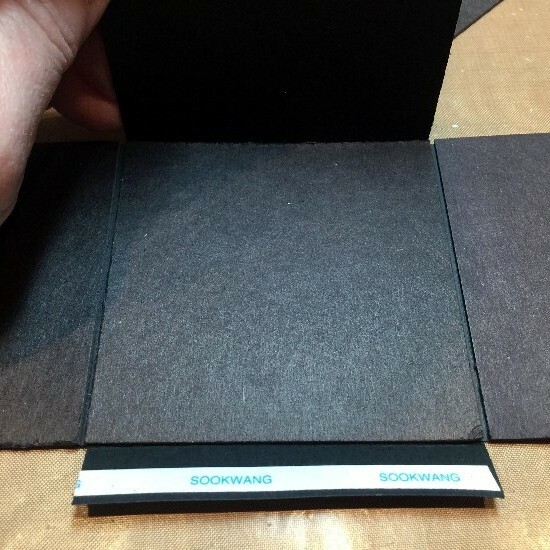 I backed the white cardstock with black cardstock and created a nice little border. I cut out two 3" circles out of heavy white cardstock and ran a black permanent ink marker around the edge. Then I began gluing a mix of the transformed chipboard gears and metal gears onto the "body" of my snowman. They were then glued in place on the center of the bottom of middle blocks to create his stacked body. His arms were created from some sticks I had out in my yard. 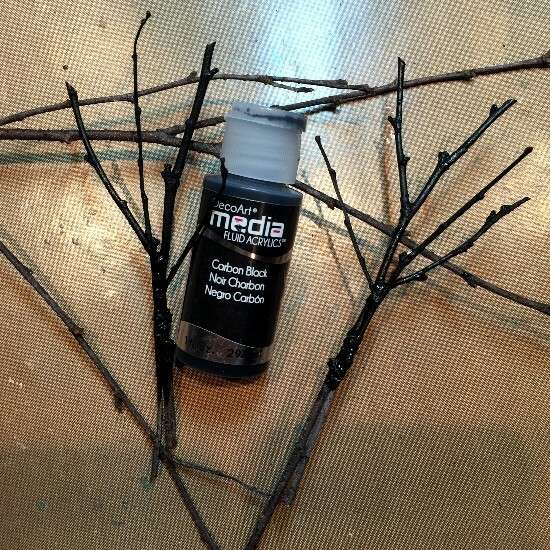 I wired two sticks together to make each arm and then I painted them black using DecoArt Media Fluid Acrylics Carbon Black paint. I cut off the excess length of the sticks, made a hole in the sides of the center block and glued the arms in place. Here is a closeup of the center body section of my snowman. Here is an example of one of the sides of the blocks containing the poem. And here is the finished snowman again, minus his little sign. 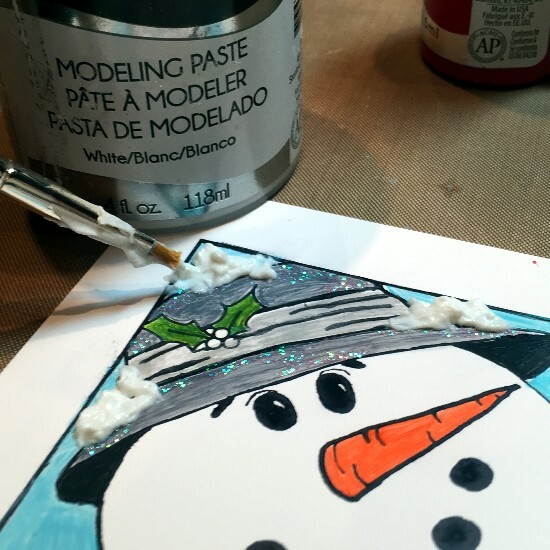 I hope you've enjoyed this pictorial tutorial bringing my snowman to life. I really hope that he has inspired you to think outside the box (no pun intended) and see the possibility of what things COULD be instead of what they are. 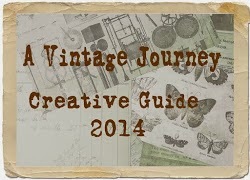 I encourage you to join us over at Creative Carte Blanche. 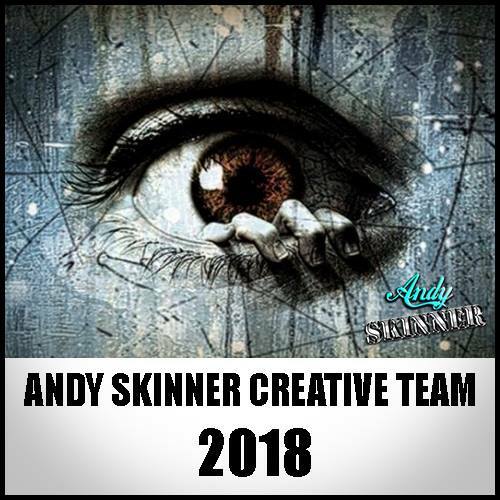 It's such a nice place to share ideas, art, our stories and just a general happy place to be with artsy friends. All I can say is "Wow, Candy!" I love the way your mind works! 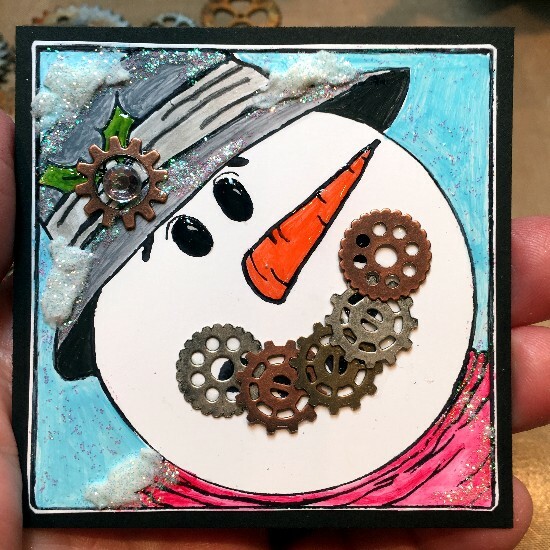 Such a clever idea to use gears along with snowflakes on a snowman! Genius! 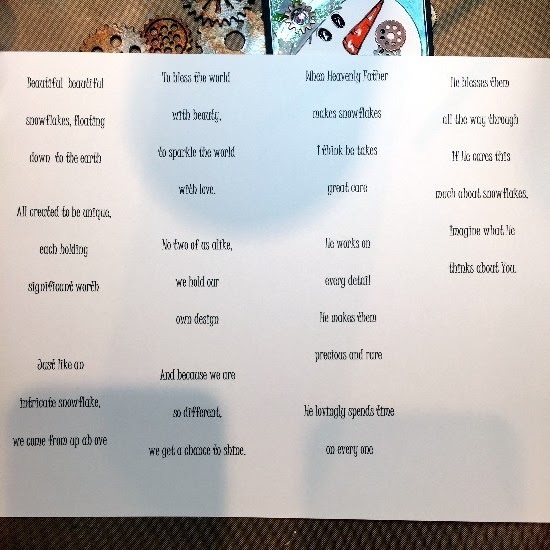 I love the poem as well along with those great B Line stamps! Fabulous! Dear Candy, another fabulous creation! 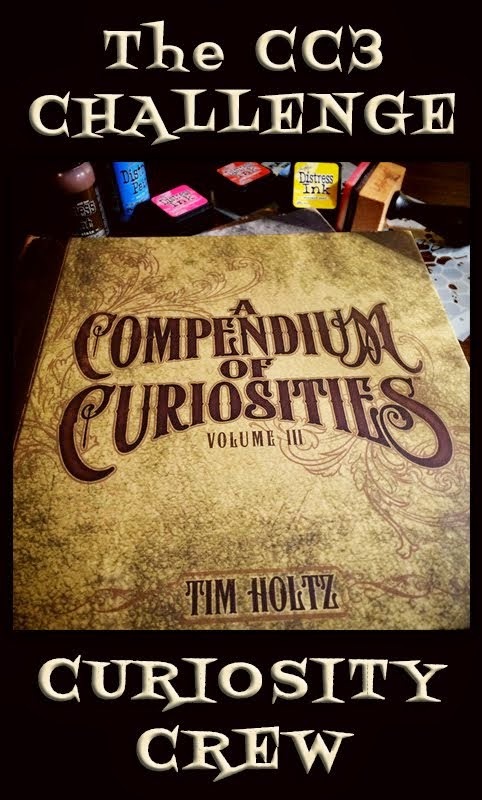 I always love reading your posts and seeing how you create your projects...there's so much to learn from you every time. Love your block snowman! Thank you for inspiring us with your gorgeous art! This project also is totally fabulous!!!!!! 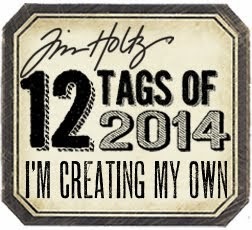 Love your way of creating from scratch your blacks too.